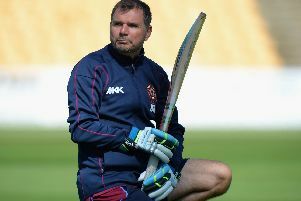 David Ripley hailed the Steelbacks’ new star Seekkuge Prasanna after the Sri Lanka all-rounder helped see off Leicestershire Foxes. Prasanna took one for 21 in four overs before stepping up to hit a six from the first ball he had faced as a Northants player. The Steelbacks needed two runs from the final two deliveries at that point, but the 30-year-old showed no signs of nerves as he blasted a Ben Raine effort over the boundary. It earned a five-wicket win in the NatWest T20 Blast opener at Grace Road, and Ripley was delighted with the player, who is available for all 14 of Northants’ T20 group games. “He’s had a great night,” Ripley said. “He bowled very tidily for the second team in midweek and got 70 in no time and the early signs are that he’s going to do very well for us. “He’s confident. A Yorkshireman and a Sri Lankan with poor English having a conversation isn’t working out too well so far, but there’s a lot of smiles, a lot of thumbs up and he’s certainly making himself very handy in the dressing room with the players. Prasanna had shown signs of his ability earlier in the week when he took one for 23 and smashed 71 off 37 balls against Leicestershire IIs. That innings included one over worth 31 runs as he hit Rob Sayer for five consecutive sixes before taking a single from the final ball. And Northants’ first team dished out plenty of punishment to their Leicestershire counterparts in the Blast opener. “It was a great start,” Ripley said of the win at Grace Road. “We didn’t have it all our own way because they came out of the blocks quickly but we pulled it back in the middle and they finished strongly. “Richard Levi and Adam Rossington took a bit of pressure off us in terms of the run rate and in the end it was Ben Duckett who helped to get us home. “It got a bit edgy at the end, but if we hadn’t come off for rain we probably would have finished it a bit earlier than that. “At the end of the season, these tight games, whether you win them or lose them, add up.